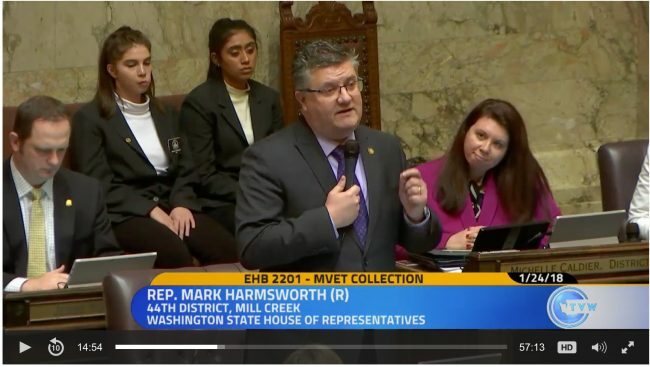 In a 60 to 37 vote Wednesday, the Washington House of Representatives once again passed legislation to lower car tab fees, reducing funding for Sound Transit. The bill adjusts the rate of the motor vehicle excise tax (MVET) Sound Transit collects. ST3 uses an MVET schedule from the 1990s, which critics say inflates the value of cars and increases the cost of renewing car tabs. Wednesday’s bill would change the valuation system and provide a rebate for past payments. Many House Republicans argued the bill did not go far enough. Last week the House tabled voting on the bill, HB 2201, in order to consider offsets to restore some or all of the funding the agency would lose due to a switch in the formula that tabulates car tabs. ST estimates the agency would lose $780M in direct funding over the next 11 years, with indirect financial impacts, such as higher debt costs, costing the agency nearly $2.3B. The bill easily passed out of the chambers last year but then lingered in the Senate. Not all Republicans supported the bill. Jacquelin Maycumber (R-Republic) voted against it, saying residents spoke when they approved ST3 in 2016. Though voting yes, Judy Clibborn (D-Mercer Island), a sponsor of the bill and Chair of the House Transportation Committee, promised to make sure ST projects are funded. Clibborn told STB she anticipates the Senate will return with a version of the bill that contains offsets which will restore funding and make Sound Transit as whole as possible. She said House and Senate Democrats are working together to establish those offsets. Rep. Joe Fitzgibbon (D-Burien), who voted against the bill this time, told STB the offsets being considered include allowing ST3 projects, which are eliminated due to future budget constraints, to be eligible for state grants. And reducing the price ST pays for WSDOT right-of-way costs. Fitzgibbon said legislators are also considering shifting or reducing the amount of money the agency pays into the education fund which all ST3 projects are required by the state legislature to pay into. The fund is estimated to generate about $500 million over 16 years. Fitzgibbon said Pierce and Snohomish counties have voiced support for using the education fund money on transit projects to ensure light rail reaches Tacoma and Everett. “It would be a hit to the agency, but it wouldn’t be a hit that would jeopardize light rail,” Fitzgibbon said about the bill. Sen. Steve Hobbs, D-Lake Stevens, who chairs the Senate Transportation Committee, said he was in support of reducing right-of-way costs for the agency and also allowing ST to pay into the education fund only after all ST3 projects are funded. Also on Wednesday, the Senate Transportation Committee held a public hearing on two bills that would lower car tab fees. No action was taken. Geoff Patrick, a spokesperson for ST, said the agency is advocating for offsetting measures to ensure that the transit expansion program remains whole. Patrick said, absent legislative action to offset the impact of HB 2201, ST would issue debt earlier to balance the agency’s financial plan. It’s totally goddamn absurd that people from outside the ST taxing district are allowed to have any say in this matter. The legislature created Sound Transit. The legislature taketh away. What should be the case: the state funds transportation needs…in rural places, that skews towards highways with the rare bus; in cities, it is a mix of less highway miles (per capita), and more transit. What has been the case: the state funds the roads, which provides the transportation needs of rural areas, but only a portion of the transportation needs of urban areas, resulting in a tax revenue shift from urban areas to rural areas. To fund the otherwise-unfunded transit portion of urban transportation needs, the urban areas tax themselves on top of existing state taxes…but only at the pleasure of the state legislature. First the state has to recognize non-car transportation needs. An ideal state would implement comprehensive transit throughout the state as a minimum baseline of mobility, just like the libraries and public schools rovide a baseline of access to information and education. The best us to have everything within walking distance like compact Europsn towns, but the second best is transit to everything. SOV access us only third of fourth best. Subsidized taxis can be a transit solution on areas too intense for fixed-route transit, and all-day inter-county connectors between rural towns and to the nearest city should be everywhere. Counties shouldn’t have to beg for a grant or tax authority for that, which may be approved one year and not the next. Both Skagit and Intercity Transit have had wildly volatile spans of service to Pugetopolis the past ten years. Transit can’t solve all rural needs but it can solve most metropolitan and small-town needs. We just need to turn the pyramid the right side up, and not make the wasteful luxury for the rich the basic level of support, leaving out everybody who can’t afford a car or Uber, or can’t drive, or doesn’t want to drive, or doesn’t want the stress of avoiding accidents every day. So…we take money away from our underfunded education system so that rich people an pay less for their car tabs? Really? We make the rich pay their fair share of taxes so we can fund both education and transit, and not make the bottom 50% fund most of the state. If the state doesn’t want to go all the way that far now, it can just take a tiny step in that direction to fund the immediate issues: keeping ST3 whole and replacing the education earmark in ST tax revenue. The Legislature needs to deal with complying with the McCleary decision first. The state supreme court is unlikely to look favorably on removing the $500 million directed to special ed without first backfilling it. Do that part first. Luxury car owners can wait. Yes, “replacing the education earmark” means backfilling it with another revenue source for education. I am giving you the benefit of doubt that you aren’t sure what the education funding portion of Sound Transit represents. It isn’t state education funding, but rather this: a stupid freebie where state republicans required the Sound Transit district to pay $500M to the state as a bribe for their vote to ALLOW the ST district to tax itself to pay for transit. The fact that the money is earmarked for education is irrelevant. The state needs to fund education, not steal money from the urban area’s transportation district, and then send it out of the district under the guise of “education”. Correction: It looks like an amendment by Rep Farrell made it so that the funds are kept within the ST district; the $500M+ was initially in the bill as a raid on ST by the state, but it turns out that was thwarted. So the education funding portion is a tax on transit, but at least it doesn’t leave the transit district. The funds in the “education account” are only distributed to the counties in the RTA, are only spent by the County Councils in the RTA (so King, Sno, and Pierce), and can only be spent in the RTA sections of those counties. Senate Rs originally wanted the $500m to be taken in as sales tax, and go directly into the state’s general fund (so taking funds from the RTA area and redistributing it around the state). Rep. Farrell fought to keep those funds in the RTA, and succeeded. The reason behind the education earmark wasn’t simply to demonstrate how low-priority Sound Transit is and who’s the boss over it; it was to fill a hole in education funding when the state made highway construction materials exempt from sales tax, which would otherwise have gone to education. The state argued that since it’s unconstitutional to use gas tax money for anything other than highways, it’s unconstitutional to impose sales tax on gas-tax funded projects. So it shifted the burden to Sound Transit levies because they were conveniently being negotiated at the time, and because the levies fund trains. The sales tax proposal was put in as a punitive measure by Senate Republicans. It had nothing, nada, zero to do with McCleary or K-12 funding needs. It wasn’t about being “punitive”. Mike Orr’s description of the history is correct. They needed money, and ST3 authorization happened to be the big pot of money that was most convenient at the time. Not true. Senate Rs (the same group that doesn’t believe that the Supreme Court had any right to rule on McCleary) demanded it as their pound of flesh to include ST3 authorization in the transportation revenue package (essentially to allow us to vote to tax ourselves). The fund set up by Rep. Farrell funds nothing directly McCleary-related, and has done and will do nothing to address the funding gap identified by the Court in McCleary. Whether or not it’s for McCleary-mandated services, it’s for education, and the nominal reason it came up was the multi-way gas tax deal. How much it filled a needed education hole vs how much Republicans used it as an excuse to gouge ST so it wouldn’t look politically like they’re giving ST everything it wanted, I don’t know. “Not all Republicans supported the bill. Jacquelin Maycumber (R-Republic) voted against it, saying residents spoke when they approved ST3 in 2016. Good to hear that common sense still exists in this wacky political climate. Yes, we need a real center, and we need both parties to get back to it like they were after WWII until Gingrich. One party gas gone off the deep end, leaving only one party to hold up the center. Thankfully most of the Republican lunacy dies not occur in Washington State, although they’re infected with tax phobia and transit-is-socialist hysteria. The D’s have a mild car bias too or this bill wouldn’t have been passed, but at least most of the Pugetopolan ones recognize that regional and local transit is necessary for a metropolis to function efficiently and reach its economic potential (and subsidize the rest of the state). Most Ds and Rs also have kids or other relatives in school. And yet, McCleary is clearly not a priority even with the Ds. Yes, there’s a longstanding underlying adversion to taxes among state residents as a whole. Income tax has been blocked several times, and sales tax on food was repealed by voters three times. There’s some support for small taxes for specific projects, although that has probably decreased in recent years outside Pugetopolis, with some reversals like Spokane Transit’s Central Line which succeeded the second attempt. Brent, maybe that’s because they realize McCleary is a crap, vague decision with no real goalpost (or, at least, a movable one). The ST tax vote was two years before the legislature outlined a comprehensive solution for McCleary. So it may or may not have addressed McCleary-mandated needs, but it was only ad hoc and for a small part of it, not anything like part of a larger strategy. What I mean by a Republican. Probably necessary to bringing back a Democrat in more or less his image. Or the other way around. For the United States to survive, we need at least two parties full of the likes of Jim Ellis. From what I’m seeing of people in between eighteen and thirty now, I give it ten years max. But in addition to honesty, intelligence and bravery, a winning campaign will begin a lifetime of clean-up work requiring a very strong stomach. Because the present Federal administration has cheated the anarchists of their chance to destroy this country’s Establishment. Throughout History…every democracy-hater starts his term by emptying every office of its every competent administrator. So from here on, in every field of public life, it’ll be every rebel’s first duty to, fast as possible, become a very competent part of the Establishment. With a good grounding in the hands-on work of their own profession. Seattle’s left us with a really great example. I wish journalists (including here) would stop calling this a bill to lower car tabs. It doesn’t lower car tabs. It lowers care tabs for newer vehicles and raises car tabs for older vehicles. The breakeven point is around 10 years old. According to the MVET schedules, cars older than 10 years old would have their car tabs raised by this bill. So on top of this bill hurting public transportation, it’s also a regressive change that hurts poor families that are more likely to own older cars. It doesn’t raise tabs for older cars. It creates a credit that only applies if the difference is positive. Owners of older cars will pay the same as under current law. (There were other bills in last year’s session that would have done as you described). My apologies, it appears I was misinterpreting the bill. Still, the regressive point remains. If taxes are cut for the wealthy and remain the same for the poor, the poor are still paying a higher relative burden which in my opinion is poor policy. Will all the sequels be as bad as for Star Wars? It’s nothing more than yet another attempt (one among many!) to gut transit funding then complain when ST can’t meet it’s promises. The “fairness of the MVET” happens to be the talking point but it’s not the main purpose of the bill. If it really about moving to the “fair” depreciation table you’d actually have to increase car tabs on older cars and make it revenue neutral, fully funding the will of the voters across three counties (with a more regressive tax structure). If the Legislature does its worst- including arguing about this ’til they all die of seniority-how much of the rest our own regional transit system can build we anyhow? “We” meaning the actual voters who approved it. Seattle? Bellevue? Highline Community College? And voters who approved ST-3 even though their counties didn’t. Tacoma? Especially LINK. Though I never liked the idea of a hard, fast, and competitive division between rail and ST Express. Hate the idea of transit existing only as dots and lines. Best possible fall-back, like a Breda-free DSTT, transitways usable by buses while being converted to rail as legislators depart for the bottom of the Great Seniority Order in the Sky. However quickly or slowly LINK can be installed. Grooved rail, or tracks just paved over. Getting passengers and their land-use “prepped” for when the trains arrive. With conversion always ready to start. Another advantage: getting express buses onto an unmistakable future railroad, pushing farther by the year into hostile territory- dissipating at least the hostility of not being able to ride it. But also important: never even think of education funding as a hostile competitor. And main advantage: Even when transferring from a bus, first train ride at eight can create a LINK-friendly legislator ten years later. And even better- all those field trips! With special ORCA “app” to pay for everybody before anybody even leaves their house. “We” don’t have tax authority outside Sound Transit. The inactive Seattle Monorail tax could raise $1 billion for something. It would have to be “fixed-guideway transit excluding light rail” if that clause is enforceable. Seattle, King County suburbs, and King County have various unused taxes they could activate, but only for small projects, not for Metro’s entire Long-Range Plan for instance. They also have to keep an unused buffer for emergencies or other urgent needs. There is a King County ballot measure coming for roads, which may or may not have a transit component or bus-street component. I don’t know about Pierce and Snohomish Counties and their cities, but they probably have a similar buffer. Psych warfare, mike. Mostly thinking of ways to make legislators from someplace else admit out loud that the only skin they’ve got in our game is located a couple layers of cloth between them and their chair. Or from whatever of ours they’re sitting on. Re: Non-Light rail. Where does the money come from for our streetcars? Because the very fast cross-country interurbans always ran miles of street track, often GP lanes before the car took off in a cloud of corn-stalks. Know those cars weighed same as a Navy destroyer. Still do that in Karlsruhe. Will bet a monthly pass there and a plane ticket to verify that whoever wrote that bill never heard of Germany . And, hey, what about large streetcars gripping and ungripping from miles of cable.? Trieste really would be even greater, because it has an ordinary streetcar grip miles of cable for several miles and then let go and run streets. And how about reserved ROW through Seattle Queen Anne Ave, upper and lower. Think they dumped the mechanism for salmon habitat, but fantastic trade-school project. Should take ST’s lawyer Desmond Brown about 30 seconds. Who’d he be up against in court? Seriously, what’s the most damage the Legislature is likely to do us, and what we can do about it if they do. Never hurts to have some fallback. Indicates that whatever the odds, we’ll fight back. Do you really see them pulling our taxing authority? Or just years of whatever next piece of harassment becomes top of the pile next? Also: What are bondholders likely to do, if what happens? And when? Link could reasonably be considered “light metro” or “premetro” if we really want to split hairs. The monorail planning started in this early stage, when ST had decided on light rail and had drawn a conceptual alignment (45th & UWay, Broadway, DSTT, Beacon Hill tunnel with a deferred station, Rainier Valley, Tukwila, SeaTac), and a long-range plan that extended this to Everett, Tacoma, and Redmond. Most existing American light rails at the time (Portland, San Jose, San Diego) were almost entirely surface and thus had a maximum speed of 35ish mph. The monorail folks were afraid Link would be watered down to mostly surface, again because voters’ highest priority was low capital costs, or at least that was the belief. The monorail team chose monorail because it’s incompatible with surface-running and couldn’t be watered down like that. (And because monorail has great views and is new and Asian and all that.) So the monorail team proposed an initial line from Ballard to West Seattle, and a long-range plan of five or six lines throughout the city, but it avoided corridors that overlapped with ST1 or its anticipated extensions. They got the legislature to authorize a monorail tax for it. At the last minute some people put in the “no light rail” provision in it to prevent it from being watered down to surface light rail like the other cities. I don’t know sure which legislators did that or who recommended it to them. The legislation does not define “light rail”, so it’s up to interpretation what it means. One opinion is it’s the technology ST was planning at the time, which is the Link we have now. There’s a debate whether the clause is enforceable at all, whether it’s too vague, or how different the technology must be. Light rail itself is a wide term going down to streetcars and up to grade-separated metros; it’s basically any two-track train between those extremes. As another aspect to this, trolleybus routes are also “fixed-guideway transit”, so would they qualify for monorail funds? Or must it be a single-track train? You’d have to get the courts to resolve this, or an opinion by the city attorney, or the city would just have to do it anyway and risk being sued or the state withdrawing the tax authority. Another open question is how much the legislators even remember that the monorail authority exists, and whether they would yank it if Seattle tries to use it now, or if it looks “too much like light rail” for them. Probably the legislators don’t care, or they’re influenced by Eymanesque tax-cutting or anti-train influences. I am contacting my representative who voted for this bill to let them know I will not be voting against them in the future. I’d rather the Republicans win their seat next term, and then it switch back to a new Democrat after that if necessary… I feel otherwise, they are never going to get the message. Please post a list of all puget sound area Democrats who voted for this bill. That will make it easier for those of us who are angry about this to make our voices heard. Unless you’re in Seattle, every single one. Single-subject voting isn’t a luxury that many Democratic legislators can afford, whether the advocacy community yells at them or not. That’s shooting yourself in the foot. Republicans who don’t want to slash Sound Transit and taxes and reject any rail or BRT or local-bus improvement proposals are rare. So one should make very sure your Republican candidate is one of the exceptions before voting for them. And they shouldn’t just be indifferent to transit, but have a demonstrated record of supporting it. And they shouldn’t be weak or they’ll get jerked around by their party and coerced to voting the party line, which again means slashing transit and other necessary things. I also don’t believe in one-issue litmus tests for candidates: what matters is their overall attitude and policy direction. Otherwise you might be throwing out the baby with the bathwater. For reasons Mike Orr points out, I wouldn’t go as far as wanting to replace Valdez and Pollet with Republicans here in the 46th, but I would look very closely at any Democrats who wanted to offer up a primary challenge. And I’d give money to any sane Democrat who wants to challenge Chopp in the 43rd. Most effective path to that end, Brendan, is to get grass-roots active in the Democratic Party. And if you don’t want to run yourself, you and other like-minded voters, replace them. Good chance that this year, you’ll be in a position to displace more than one legislator. Like it or not, the absence of an income tax is a huge reason why it’s attractive for companies to do business here. It would be stupid to get rid of that. Am I the only one who follows this blog that is happy about this? The voters were misled on the costs. I explicitly remember ST saying the average taxpayer would be putting out about $178 bucks a year for ST3, and that’s what I told people why they should vote for it. That’s not what happened at all and the public was mislead, this action corrects that. Now can we scrap the downtown to Ballard route and run the line from Ballard to the u- district? That might save a couple billion. The voters were misled on the costs. I can just as well say the voters were mislead on the increase in costs by other things changing at the same time. At the end of the day, it’s their fault for not paying attention to the details or looking at any of the online calculators that got it right. If that happened, I’d be overjoyed. I’m not holding my breath; the ST board will fight as long as they live against any good ideas like that. That’s the average taxpayer. Any specific taxpayer will be above or below this. ST provided a tax calculator for people to estimate their individual tax impact. ST is doing what it said it would do in the ballot measure. It provided a tax calculator before the vote. It’s using the MVET schedule that current law requires it to use. If the legislature was unclear about the state of its own laws, that’s its problem. As I understand it the old schedule was put in place for ST1 and 2. Then the new schedule came out and was going to be used for something, but that something was canceled and the new schedule went away with it, leaving the old schedule in force. The legislature has three intelligent choices. If it thinks ST is breaking the law, it can sue ST and have a judge confirm it and impose penalties. It doesn’t need a new law for that. If it thinks ST is acting lawfully but it doesn’t like the old schedule, then it can change the schedule. In that case it’s false slander to say ST is breaking the law. If it thinks ST misled the legislature by failing to remind them of which schedue was in force, then that’s far-fetched but it’s a matter of opinion. The real issue would revolve around how much it was ST’s responsibility to remind the legislature of this. Again that’s a matter of opinion. In that case the legislature could, I don’t know, send ST a letter of disappointment, or find some way to change the laws for future tax proposals. The legislature could do any of these things. What it can’t credibly do but some legislators are doing is all three: accuse ST of breaking the law, change the law because it doesn’t like the schedule that ST is lawfully using, or accuse ST of misleading it during the original proposal. It’s either one or the other, it’s legal or it’s not, it’s not both at the same time. They should already be giving Sound Transit a break on the WSDOT land so we can get this built cheaper and faster. 2 lanes of light rail is the most efficient use of that land anyway than blowing it on future road expansion to make traffic worse. Sound Transit should also be given greater power on par with state institutions so they build transit and not have to be held hostage by every tiny little jurisdiction on land use, zoning and NIMBY BS. We had this debate in 2017 and it is public record I took a different and way more moderate position then. We had an initiative on the table to address this as well and as per the initiative process, lack of public support snuffed the initiative out. Good edits, maybe I should have left my thoughts at the edited version ;-). Just torqued.